Practice can be a players greatest means of improving any skill in life, if their is a purpose and a process to the practice. Malcolm Gladwell, a journalist for The Washington Post, published a book in 2008 called Outliers: The Story of Success. This book outlines how successful people spend 10,000 hours improving on skills to reach the point of perfection. This is something that can be up for discussion due to natural born talent and other timing circumstances that can help accelerate people with their development of a skill. But, none the less there is a time element to improvement for anything in life. The flip side of the coin is that certain players can improve while, not practicing at all. This form of improvement or practice is called, Phantom Practice, which means their is some of the population that can improve their skill while mentally convincing themselves they are getting better and they had a very good comprehension of the skill before they ceased their practicing sessions. This player also has more of a Kinesthetic Memory, which means they have a high level of muscle memory and is a very confident person by nature about their skill in that area. 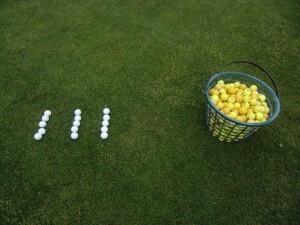 If you are not the player that can meet your quota 10,000 hour quota or the player with a natural born ability to improve while not practicing, then you will be at the range this summer working on your game. The type of practice you should be implementing is Purposeful Practice. This is what PGA Tour Professionals do to become more efficient with their time on the practice tee, they have a process and a purpose. There is an image below that depict two styles of practice and we are going to discuss the difference in the two and how one can help and one can lead to frustration and potential loss of confidence. Please feel free to contact me for ideas on how to make your practice more efficient and effective. Remember, Purposeful Practice and not Ciaos Practice.